Just a few weeks after we were treated to a series of stunning renders of the upcoming OnePlus 7, which looks to set to sport an all-screen design and two-tone gradient effect on the rear case à la Huawei P30 and P30 Pro, we now get to see the gorgeous handset in motion. 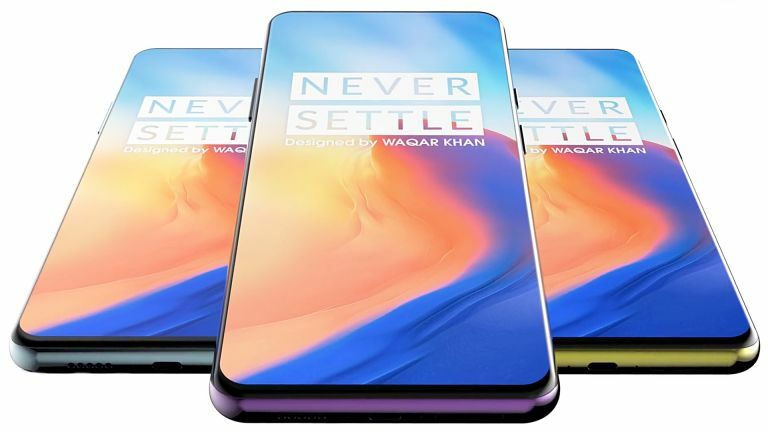 YouTuber creator Waqar Khan has published a slick product video that shows the OnePlus 7 from every conceivable angle. The device in the clip tallies with previous renders shared by reliable tipster @OnLeaks who posted a series of high-resolution images based on CAD models used in the manufacturing process. As previously rumoured, the new flagship device from OnePlus – which will be entirely separate from its £1,000 or so 5G-touting handset – looks set to boast a truly edge-to-edge screen that dominates the front of the smartphone. To accommodate that all-screen design, OnePlus is expected to relocate the 16MP front-facing camera to a small pop-up drawer that emerges from the chassis above the display – slightly off-centre. The video from YouTube creator Waqar Khan also reveals the stunning, shimmering new colour options. It makes sense that OnePlus would like to move away from the slightly drab aluminium cases it has used on previous generations of its smartphone. According to Huawei, last year's P20 series helped it become the only manufacturer in the UK to sell more colour handsets than those with a plain black finish, which is typically the biggest seller of any smartphone line-up. As previously rumoured, we can expect to see at least three new colour finishes from OnePlus, purportedly dubbed Black Yellow, Black Purple, and Cyan Grey. OnePlus 6T vs Google Pixel 3: which is the best Android flagship? Based on the latest whispers from inside the smartphone start-up, OnePlus looks set to include a triple-camera on the back of the handset. That'll be a significant step-up from the rear-mounted dual-camera system that we've seen on the back of flagship OnePlus smartphones since the launch of the OnePlus 5 in June 2017. We're expecting that triple-camera to combine a 48MP primary camera with a 20MP and 16MP lens. OnePlus already offers portrait mode images with artificial bokeh-style blur behind the subject of the photo, so it's unclear what the additional camera will bring to the table. The safe money will be on an ultra-wide camera, like the one seen on the Huawei P30 Pro and Samsung Galaxy S10. Tipsters point to up to 256GB of internal storage and a 4,000 mAh battery with the same 44W Warp Charging that launched with the OnePlus 6T McLaren Edition. There won't be wireless charging, as OnePlus still doesn't think it's worth the hassle. As always, it's worth taking these rumours with a healthy pinch of salt. The only detail we knew for sure about the OnePlus 7 will be powered by the Qualcomm Snapdragon 855 system-on-a-chip, something OnePlus confirmed during the annual Qualcomm Summit in December last year.